Italian Maria Cressari established a women's new hour record 1972 in Mexico City in the Olympic Velodrome. Her average speed was 41.471 kph (25.7 mph). The record stood for six years. She was also the road race Italian national champion in 1964, 1968, 1972 and 1973. 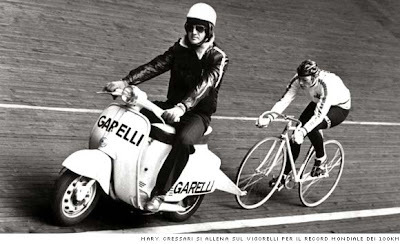 Photos: some nice old photos; the last of Cressari training at the Vigorelli for an eventual attempt on the 100 km record. On Sunday, November 1st, the Italian Championship for Ex-Professionals will be held in Cittiglio (VA). The start will be in front of the Afredo Binda museum on via Marconi at 1500. The race will be criterium style with 17 laps for a total of 30 km. It should be great fun for the spectators. Four tricolor jerseys will be awarded in 4 age groups. 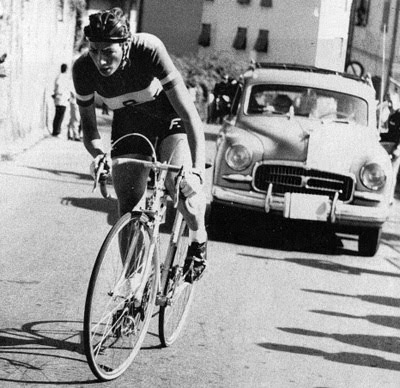 Among the ex-professionals racing (birth year in parenthesis): Francesco Moser (1951), Gianni Bugno (1964), Claudio Chiappucci (1963), Stefano Zanini (1969), Daniele Nardello (1972), Danilo Gioia (1966), Mauro Vigna (1938) , Carlo Rancati (1940), Ennio Vanotti (1955), Patrizio Gambirasio (1961), Renato Rota (1946), Mario Bertazoli (1943), Marco Dalla Vedova (1972), Germano Barale (1936), Florindo Barale (1968), Enrico Guadrini (1945), Valerio Tebaldi (1965), Nicola Loda (1971), Damiano Capodivento (1943), Francesco Prina (1919), Pasquale Pugliese (1952), Imerio Massignan (1937), Luigi Zaimbro (1936), Giulio Ricciardi, Piero Coppi, Cristiano Frattini (1973), Mario Lanzafame (1949), Marcello Bergamo (1946). Gran Fondo USA LLC, which has already announced two granfondo events for next year (in San Diego and Philadelphia), is adding a third city for 2010: Los Angeles. The San Diego event is scheduled for 7 March, 2010, and the Philadelphia event is scheduled for August 8, 2010. No date has been announced for Philadelphia. Previous story here. Paolo Bettini is scheduled to be at the San Diego. 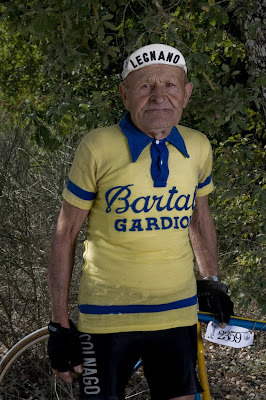 I like this photograph because it reminds me of all the Italian old-timers that still ride strong. Here is Sig. 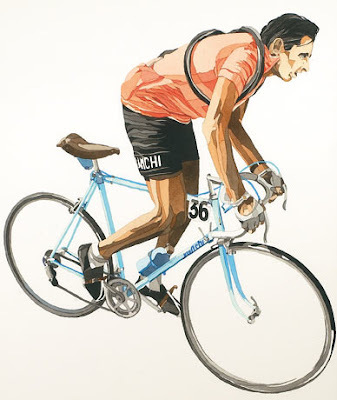 Cuccuini who at 88 years was riding at the L'Eroica. Not only that, he was good friends with Gino Bartali. 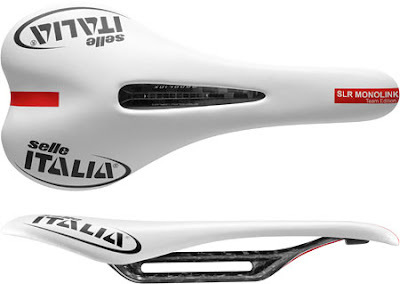 Selle Italia has announced the introduction of their "Monolink" system. Prototypes have been seen at bike shows since 2007 but it is finally coming to market. 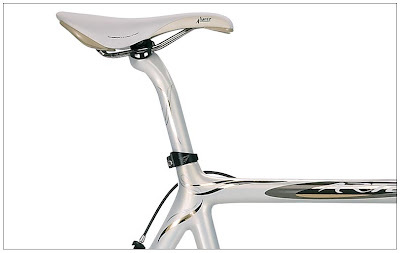 The saddle uses a single carbon weave rail which according to Selle Italia increases the torsional strength by 30% and the crash resistance by 300% compared to the traditional carbon railed saddles. The rail is made of HM K6 carbon fiber. The matching seat post is claimed to be 50% stronger due to the new clamping system and the use of HM K3 carbon fiber. Added benefits are more front and rear saddle adjustability, and ease of adjustment (something I can appreciate after dealing with a two bolt Campagnolo seatpost this weekend). Weight is 160g (+/- 8%). Monolink will initially be available in 31.6 in 300mm and 350mm lengths. Buzz used a Canon SD780IS point and shoot camera in video mode mounted on the handlebars with a mini-tripod with a built in velcro strap (available at REI and camera stores). 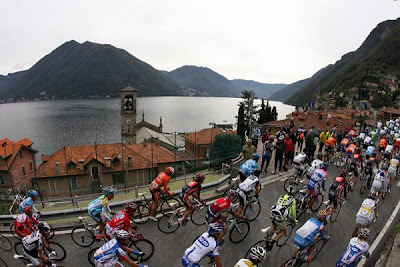 The Gran Fondo Nove Colli, the largest granfondo in Italy, will be getting larger in 2010. Celebrating its 40th anniversary next year the rider limit has been raised to 12,000. Even at that there will be riders turned away. The race start is in Cesenatico, home of Marco Pantani, on Sunday, May 23, 2010. For those who are interested in a package consisting of race entry and hotel accommodations registration opened on October 24th. This will guarantee a start in the third starting grid (blue grid). If you are interested in race registration only, registration will open on November 28th. Registration fees will go up this year to 50 Euro. "Are you strong enough?" This is the question that Elite is asking all cyclists and two wheel fans in its new ad campaign for its 2010 Realpower rollers. "Are you strong enough?” is a message presented in three original short videos starring Elite Realpower, the electronic roller that can provide gradients of up to 20% simulating the genuine sensations of a real road race. The Realpower roller features innovative magnetic powders in the resistance unit combined with with electronics and software. The videos present the Realpower product and all the software applications for the roller, including a GPS system that allows a rider to input and revisit road routes already ridden, and an Internet racing feature for access to limitless on-line challenges with other enthusiasts from all over the world. 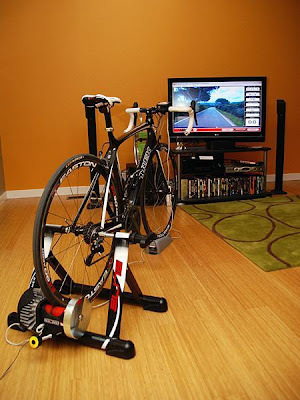 It also comes pre-loaded with Giro d'Italia and Tour de France stages. "Can you afford it?" could be another question. Price is approximately $1,900. Visit the Elite website, www.elite-it.com, to read about all the features of the unit. CICLISMO magazine has a particularly glowing report of the new Bianchi "Infinito" (Infinity) bike. The new Infinito is the top model in the C2C (Coast 2 Coast) category which is intended for long distance riding in comfort with maximum performance. Bianchi has changed the geometry of the Infinito by having a taller headtube than other C2C models, slightly more than 1.5 cm in order to provide a more comfortable position (with the added benefit of eliminating the need for lots of spacers). Adding to the comfort is the use of a new type of carbon fiber, Toho Um 40, applied to certain parts of the frame. A new full carbon fork with a semi-straight fork was also developed for the Infinito. 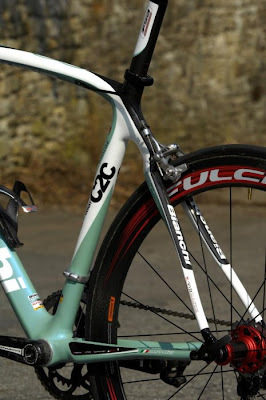 CICLISMO's review concluded that in this new frame Bianchi has been successful in building a frame that is both more aggressive and comfortable. It is very responsive and lighter, and much more competitive for climbing and responding to accelerations. The frame, according to CICLISMO, is ideal for granfondos and suitable for those that are fairly ambitious but not necessarily obsessed about every second (well, for those riders Bianchi has the HC-Hor Categorie and B4P-Born 4 Performance series). 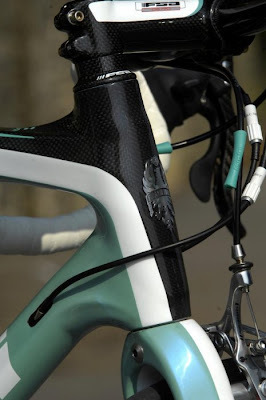 Having said that, note that Robbie Hunter of Team Barloworld/Bianchi rode an Infinito during the 2009 Giro d'Italia. 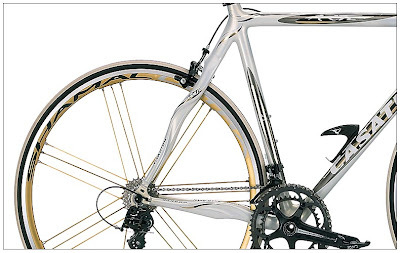 The Infinito can be ordered equipped with Campagnolo Veloce or Athena, or Shimano Ultegra in which case it comes in the celeste/white, blue/white, or red/white as pictured above. It is also available as a frameset only, but oddly only in blue/white or red/white. Italian component maker PMP brought their prototype "Circular Pedal System" (CPS) to EICMA. The company is known for its lightweight products and this pedal system, in titanium, weighs in at 145 grams for a pair. 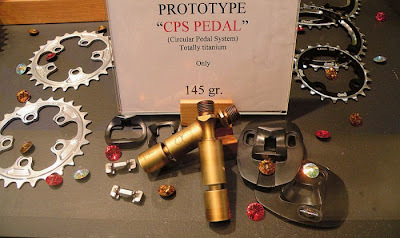 The pedals will go into production once the current feedback phase of road testing and final modifications are completed. LPR Brakes - Farnese is finished. New team manager Giovanni Fidanza has announced that bicycle manufacturer De Rosa and chemical company Stac Plastic have teamed up with him to create a new Italian Continental Pro Team for 2010 "De Rosa - Stac Plastic". The new team hopes to earn a spot for the Giro d'Italia. LPR Brakes cancelled their sponsorship of the team after Danilo Di Luca, now serving a suspension, tested positive for doping. Eleven LPR riders are coming over to the new team and another four have been signed. Cristiano De Rosa said, "The desire is to do well. We will evaluate the project periodically but our idea is that this is a long term project. We decided to invest and put our name first because we are a cycling company and we believe in what we make." 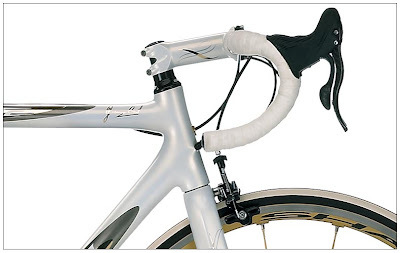 In Part I we covered the Campagnolo Record carbon water bottle cage at $ 159.95. 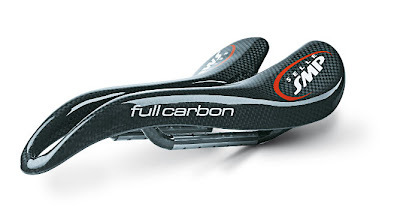 In this installment of Sticker Shock & Insanity we have the Selle SMP Strike Full Carbon saddle, "The flagship of the SMP series. The SMP Strike Full Carbon represents the pinnacle of comfort and ergonomics while combining the weight savings of a carbon fiber. 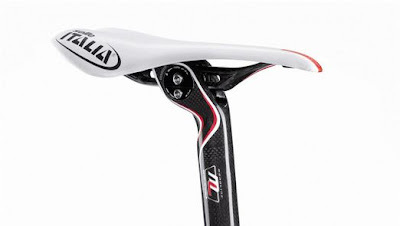 Weighing in at a scant 105 grams makes this saddle ideal for your feather light racing machine. " Price? An astronomical $ 699.95. If you do not believe me see here. Alessandro Petacchi, "I saw in the program that there are seven stages for sprinters, a large number for a grand tour. I will try to prepare myself better and I think I still have many things to say on the road." Mark Cavendish, "Seven stages for us? It is definitely nice, I'll be there Because I love the Tour of Italy." Later, Cavindish said that there is a possibility that Team Columbia might skip the Giro in order to race in the Tour of California (the races will overlap each other in 2010). Alessandro Ballan, "I'm a little ashamed, in seven years as a professional I have never raced the Corsa Rosa. 2010 will be good a good year, I can not wait to race my first Giro." Rinaldo Nocentini, "I know the stage of Montalcino, with the white gravel roads, very well. It is close to home. It would be nice to give a victory to all the fans who follow me. Pozzato We hope does not enter the Tour Because He could be a very dangerous opponent in this stage. The pink jersey? Wearing it would be nice but it seems not an easy undertaking. "Nocentini wore the yellow jersey in the Tour de France for 8 days last year. Ivan Basso, "It will be a hard Giro, very difficult in the second part. I think I can race two Grand Tours as a rival and end up with an important result." Damiano Cunego, "It is too stressful racing for the overall classification. It is easier to aim for a particular stage. You can show yourself better this way. There are three, or four stages suited to me: Terminillo in the first week and in the third week: Mortirolo or Plan de Corones, even if it is a time trial, it is a hard one. " Dennis Menchov, last year's Tour winner, "I can do well in the climbs when my form is at its best. If I really want to go for the Giro win again, I will just modify my preparation to be in a position to win. I like the stages in the last week, the mythical ones, like Mortirolo and Gavia. " Carlos Sastre, "It's a very attractive course with a final week with three consecutive stages of high mountains, and the legendary climbs of Gavia, Mortiriolo, Zoncolan and the time trial at Plan de Corones. I also like it because the time trials do not affect the race too much, the mountains will make the difference. You ask me if I will be in Amsterdam? I want to see the Vuelta course before deciding, but I like this Giro." Team Sky Sports Director Scott Sunderland, "You will win the Giro in the mountains, but you will lose the Giro in the first three days of the race and the team time trial." Stories, including cycling trip stories, for the Italian Cycling Journal welcome; contact veronaman@gmail.com. See here for a chance to win a T-shirt for submitting a story, contest ends October 31st. with a final week with three consecutive stages of high mountains, and with so many legendary climbs such as Gavia, Mortiriolo, Zoncolan and the time trial at Plan de Corones. I also like because the timing does not affect too much the race, but will be increased to fund and make a difference. You ask me if I'm in Amsterdam? 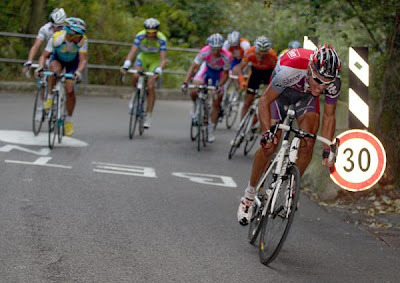 I want to discover the location of the Vuelta before deciding, but I like this Giro candle ...». Team Sky Sports Director Scott Sunderland, "You will win the Giro in the mountains, but you will lose the Giro for the first three days of the race and the team time trial." Stage 15: Mestre-Monte Zoncolan km 218: Monte Zoncolan max height 1730 meters, 10.1 Km long, 1200 meters of elevation gain, average grade 11.9%, max grade 22%. Read a ride story of the Zoncolan here. Stage 20: Bormio-Ponte di Legno Tonale km 178: Forcola di Livigno max height 2315 meters, 18 km long, 1278 m of elevation gain, average grade 7,1%, max grade 13%); Passo di Gavia (Cima Coppi) (max height 2618 meters, 24,9 km long, 1399 meters of elevation gain, average grade 5,6%, max grade 14%); Passo del Tonale max height 1883 meters, 11 km long, 631 meters of elevation gain, avergae grade 5.7%, max grade 10%. Gavia ride story here. Note: some of the above stages also include lesser climbs(!). Stories, including cycling trip stories, for the Italian Cycling Journal welcome; contact veronaman@gmail.com. See here for a chance to win a T-shirt for submitting a story; contest ends October 31st. "We are proud to be the choice of the organizers for conclusion of the next Giro d'Italia in Verona. The Arena (ed. 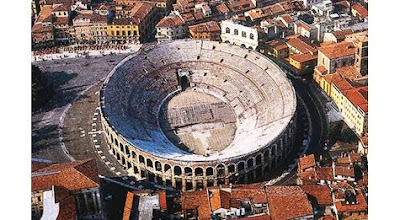 note: the Roman coliseum in Piazza Bra) is a setting worthy of the event, and the city of Verona will be up to the task of hosting such an important event." 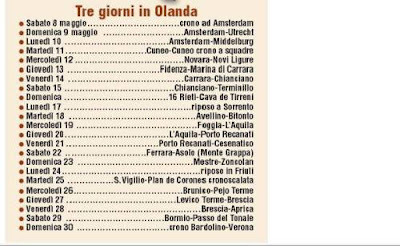 These are the comments by Mayor Flavio Tosi to the news that Verona and its Arena will be hosting the final stage of the 2010 Giro d'Italia. 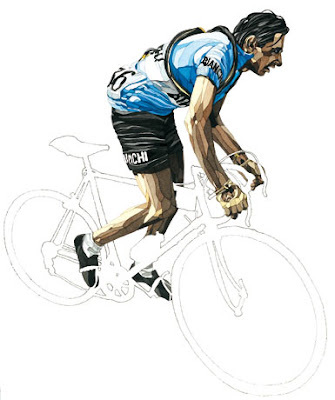 Verona Sports Counselor Federico Sboarina added, "May 30, 2010, will be a great day for Verona and for sport in the city which falls 26 years after the historic 1984 edition won by Francesco Moser." Damiano Cunego summed up the race as, "A very classic Tour of Italy in the final week that has the difficult, and Legendary, mountain stages." These include: Mortirolo, Zoncolan, Monte Grappa, Plan de Corones and Gavia (Cima Coppi), and others in between! It will be a shattering week. There will be three time trials (TT) And one team time trial (TTT). Regarding Stage 11, race director Angelo Zomegnan said, "President Napolitano asked us not to leave the people affected by the earthquake alone so we will go there." Tomorrow, Saturday, October 24th, is the presentation of the 2010 Giro d'Italia beginning at 1630 (local time in Italy; 1030 USA Eastern). Check http://www.cyclingfans.com/ for live video feeds. RAI will be broadcasting the presentation via their website but I think for most people going to cyclingfans will be simpler. Above is a version of the rumored stages (click to enlarge). We will know soon enough! Yolanthe Cabau van Kasbergen will be the new face of Giro d’Italia 2010. Tomorrow, October 24th, she will be a special guest for the live presentation on RAI 3 and Gazzetta.it. 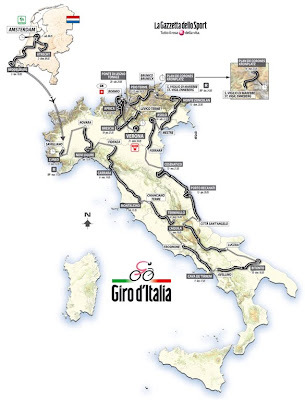 She will announce where Giro d’Italia will finish at Sunday, 30 May, 2010. Thanks to Carlo v. from the Netherlands (where Yolanthe is very popular) for the story. Stories, including cycling trip stories, for the Italian Cycling Journal welcome; contact veronaman@gmail.com. See here for a chance to win a T-shirt for submitting a story; contest ends October 31st. Ernesto Colnago will not be amused when he sees this. 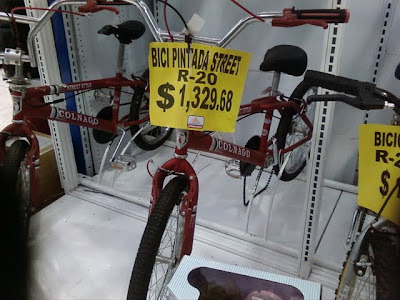 "Colnago" branded bikes in a Walmart-type chain in Mexico (Mexico uses the $ sign for its peso currency). Bbox Bouygues Telecom's manager, Jean-Rene Bernaudeau, has announced that the team will be riding Colnago bikes next season. 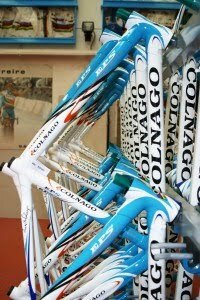 "Our new bike supplier is Colnago. It is a historic brand and very prestigious." It will be nice to see the Colnago name back in at least one grand tour (the Giro d'Italia) after a period of absence. 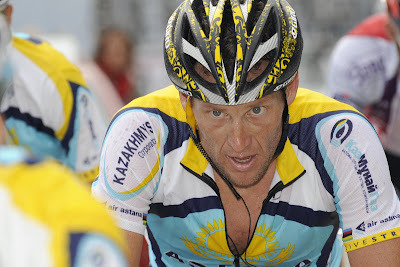 Lance Armstrong tweeted today, "I've decided to ride the Amgen Tour of California in 2010. Can't wait.". With the Tour of California moving from February to May on the racing calendar next year the announcement signifies that Armstrong will not be racing in the Giro d'Italia. The Tour of California will be May 16-23; the Giro d'Italia will be May 8-30. 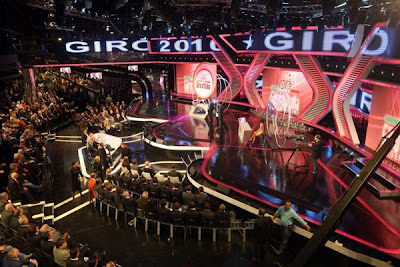 Saturday, October 24th, is the presentation of the 2010 Giro d'Italia. Trivia: Only two riders have won the Giro d' Italia every time they have entered: Bernard Hinault (1980, 1982 and 1985) and Alberto Contador (2008). 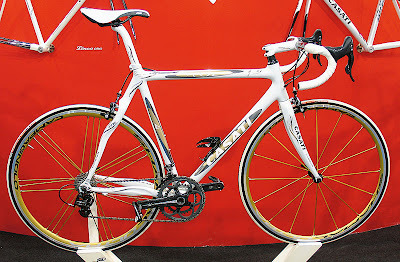 The De Rosa "Raga"was displayed at EICMA. The frame is full carbon and the geometry is designed for 24 inch wheels. Designed to be rigid to go fast but yet also comfortably. 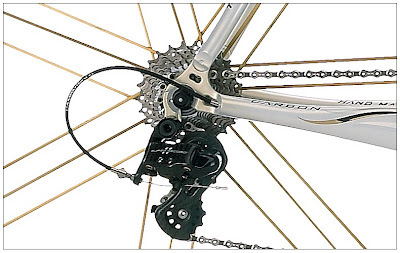 The components are a mix of Campagnolo and Miche. What kid wouldn't be proud to own it? The Dedacciai "BOLD" prototype was on display at EICMA. 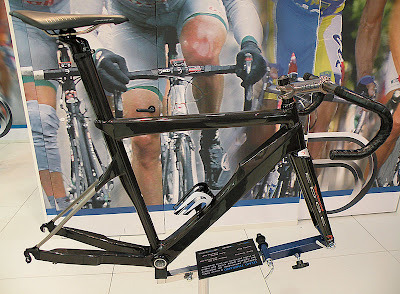 The frame is characterized by oversized everything with the exception of the chainstays which are titanium (click on image to enlarge). 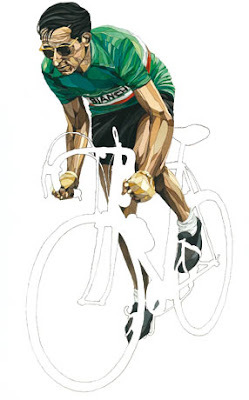 Fausto Coppi artwork by Claudio Pesci (via Calvart,73; 40129 Bologna). See more art and contact information at his website. There will be a new play-by-place voice on RAI for cycling beginning next season. After twelve years, and the being the voice of ciclismo, Auro Bulbarelli moves on to become a deputy director and head of the cycling division at RAI. Taking over for Bulbarelli will be Francis Pancani. Pancani has been providing reports during the Giro d'Italia from the RAI motorcycle. 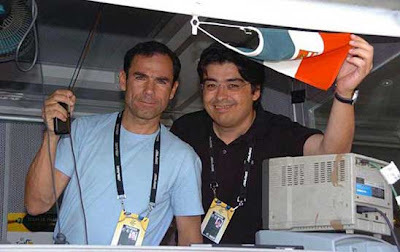 Bulbarelli's last broadcast was from the Giro d' Lombardia. Davide Cassani, the former professional, who has been working with Bulbarelli in the RAI broadcast booth will continue in his role. The Casati "Arte" might easily pass for something that it is not. It is in fact a titanium and carbon fiber frame in which all the transitions from one material to the other are seamless with no unevenness. The tubes and rear triangle are carbon fiber joined to titanium lugs. All cable routing is internal. Each Arte is custom made to measure and includes a fork (full carbon 1 1/8"), seatpost, steam and headset. Casati is celebrating their 90th anniversary this year and have a special edition frame available. In this video Rory takes his 1973 Ciöcc to Giovanni Pelizzoli, founder and framebuilder of Ciöcc frames, to be restored. At the beginning of the video Giovanni explains that Ciöcc was the nickname of both his grandfather and father and that he decided to use it as the name for his frames. Furthermore, he says that the name means nothing but did bring him good fortune. A Ciöcc was used by Claudio Corti to win the 1977 U23 World Championship at San Cristobal, Venezuela, hence the name of their signature model. At the end of the video his son, Samuel, talks about how the frame will be painted and that the fork will be sent out for chroming. As the Italian cycling season concludes, with the last major granfondo and pro-race already having taken place, the last long distance randonnèe is also on the October calendar. The Randonnèe "delle Foglie Morte", 192 km, is scheduled for October 25th beginning in Samarate (VA). The event is organized by ASD CICLI TURRI CARRERA of Varese. The Giro di Lombardia, also known as the "Race of the Falling Leaves", which concludes the pro-racing calendar in Italy was won by Belgian one-day specialist Philippe Gilbert. Damiano Cunego could not obtain his 4th victory in the race (his third in a row). Gilbert, arriving with Samuel Sanchez at the finish, was just too strong in the dual sprint. Russian rider Alexandr Kolobnev won the sprint behind for third place seven seconds later while Cunego finished 14th. World Champion Cadel Evans worked hard for Gilbert on the final climb of the day, the San Fermo della Battaglia, which set-up Gilbert for his victory. On the other hand, Cunego failed for what he believes was lack of team Lampre support. "I need someone there to help me, I practically did it all on my own," Italy's Cunego told La Gazzetta dello Sport. "Giro, salite storiche. Milano in castigo"
Thinking of Living in Italy?